What is the Big Banyan Tree? Providing a shade of more than 100 metres, The Big Banyan Tree is 7 Metres wide and 17 metres tall. 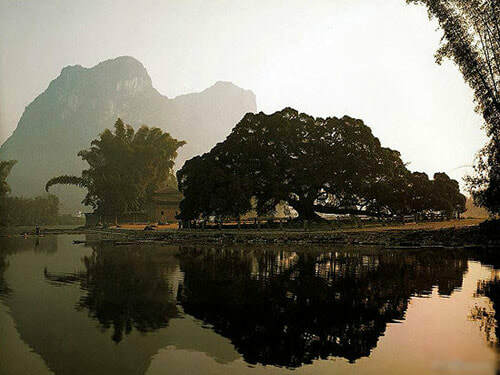 Located on the west bank of the Jinbaoriver and almost 8 kilometres south of Yangshuo City, The Big Banyan Tree’s history is spread over 1300 years. Also known as a token of love and happiness in today’s time, the Big Banyan Tree was considered next to god in the ancient times and was known to provide people with cures and medicine for their illness. ​It is definitely worthwhile to visit during your Yangshuo and reminds people of persistence and dedication to withstand a thousand years of rain, snow, winds and storms. The Big Banyan tree provides a hope to people that whatever may be the circumstances, standing and holding your ground would make you an immortal through the pages of human history. Also, an important feature of the Impression Liu Sanjie, The Big Banyan tree is surrounded by lights and sounds portraying its vivid history through plays and dance eventually unfolding the magical and mystical stories that surround it. The Big Banyan Tree is so old that the visitors can see its roots penetrating the ground at uncertain proportions digging many metres into the ground making it stand firm and assuring survival for another 1000 years or more. A treat for the nature lovers and photography enthusiasts, the Big Banyan Tree is known to strike an impressionable pose for every lens willing to capture its glory and might filled with thousands of years of legacy. The Big Banyan Tree can be visited at any time across the year during your Yangshuo Tour. Leaving its print on the sands of time, The Big Banyan Tree invites the visitor to witness its beauty and might at the same time. Interested in visiting the Big Banyan Tree on a Tour? Wendy Wei Tours offers a variety of different packaged tours as well as custom tours including the Big Banyan Tree, among other attractions and destinations. To find out more, please visit our Tours page or Contact Us directly to find out more.